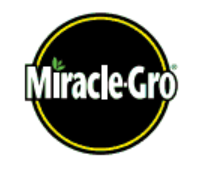 *This post is a sponsored post with Miracle Gro. I was given Miracle Gro products to use, however all opinions, statements and ideas are my own. With summer right around the corner, teachers and students are wrapping up the school year. I am always looking for a fun and unique way to show my children’s teachers how much we appreciate all that they do for our kids all year long. I like to give them something they will actually enjoy using in their classrooms and/or their homes. A good teacher can make a huge difference in a child’s life. This season, Miracle Gro wants to inspire everyone to get out and Gro something. There is a way to incorporate “Gro-ing” into a myriad of different DIY projects—and you don’t have to be an avid gardener or live out in the country to accomplish it! All you need is a little creativity and inspiration—and you can create a beautiful, living piece of art for just about any occasion/recipe/area of your home! So, with that in mind, I wanted to make a simple but lovely succulent table top garden that my children’s teachers could enjoy and continue to grow after my children move on. If you want to make one, it is really so simple and you just need a few things. 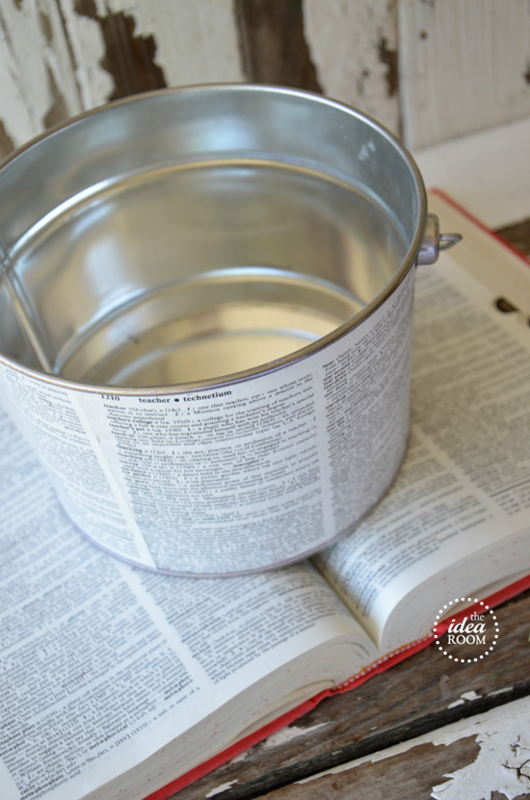 Take some old dictionary (or other paper) and cover the pot with them. 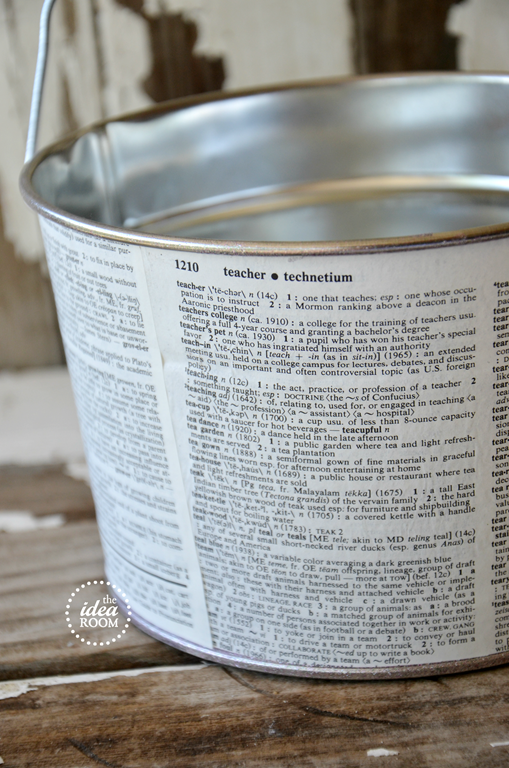 Use a couple of layers of Mod Podge on the front and back of them and attach them to the container. I specifically used the “teacher” and “grow” dictionary pages along with a couple of other words that remind me of a great teacher. Fill your container with Miracle Gro Moisture Mix Potting Soil and leave about 4 inches at the top. 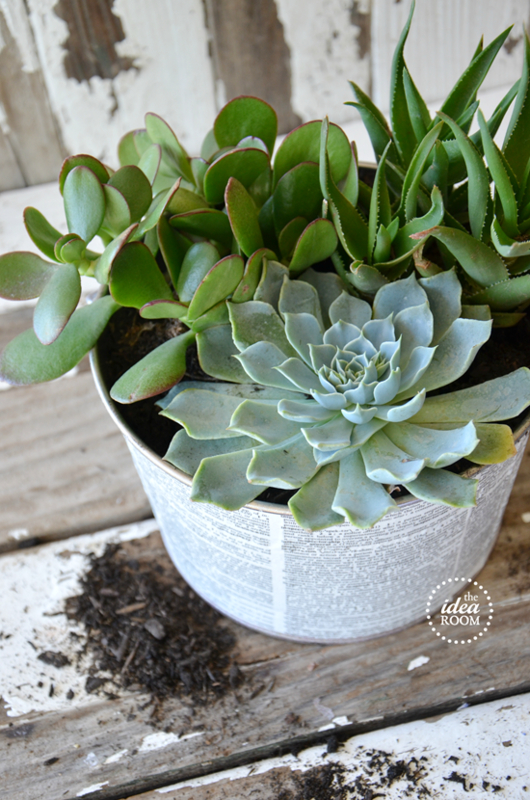 Plant your succulents and then add more potting soil and fill in the soil to the top of the container. Gently pack the plants into the potting soil. *For best results drill a couple of small holes in the bottom of the container and place some gravel in the bottom to ensure proper drainage. Simply print out the label and cut it out. Then paste it onto a piece of dictionary paper and then glue that onto a rectangle piece of black paper. For an extra touch, I added a little metal stake in the pot with the word “grow” on it. It is simply an old spoon with some vinyl letter stickers on it. Just stick it in the soil. This is a pretty simple way to grow something beautiful as a gift or for your own home. LOVE this! So cute, thanks! I love succulents. I saw a project online of a living succelent wreath. I would love to try that project, too. The Origami Garden is adorable, I’m going to give it a shot! I love the succulents as well. I am looking for an easy way to bring the outdoors inside this summer. This project is perfect. I am loving your succulents! I have lots of planting, indoor and outdoor, that I am wanting to do! I am really wanting a Boston fern, some hostas, and some geraniums for an outdoor project. I’ve been dying to make a succulent project that I found on Pintrest! What a great and easy idea! Love it. I have a cute little flower bed in my patio area that is empty. I’ve been itching to get in there and make it beautiful with some flowers. Love your posts, keep em coming! In Miracle Gro’s #GroSomething initiative, I’d like to plant herbs in old soup cans. 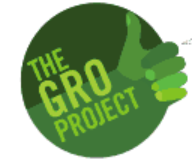 Miracle Gro’s #GroSomething initiative is so awesome! I am wanting to do coffee can garden for my patio! I like this idea. And I’ve been thinking about making some small pots out of hypertufa, so I might combine this project with my hypertufa idea. My project would be a container garden, I would like to start plant spices/herbs in small containers. (using recycled bottled water). I don’t have very much space for a garden, but a container garden is on my to do list! I would start on my pond. My backyard is a blank slate and I would like to put my pond in, and add some pretty flowers around it! I would love to plant some beautiful flowers in my front yard. Fabulous project. I have been wanting to start an herb garden in the kitchen window. I would start with that. Then move on to a berry garden that I am dying to get going. I love this project, but I would be keeping it for myself!! My flowerbed is severely lacking. I would definitely spruce it up and plant some herbs. I’m really interested in making a micro herb garden. Thanks! I would do exactly what The Idea Room showed us. A succulent garden! 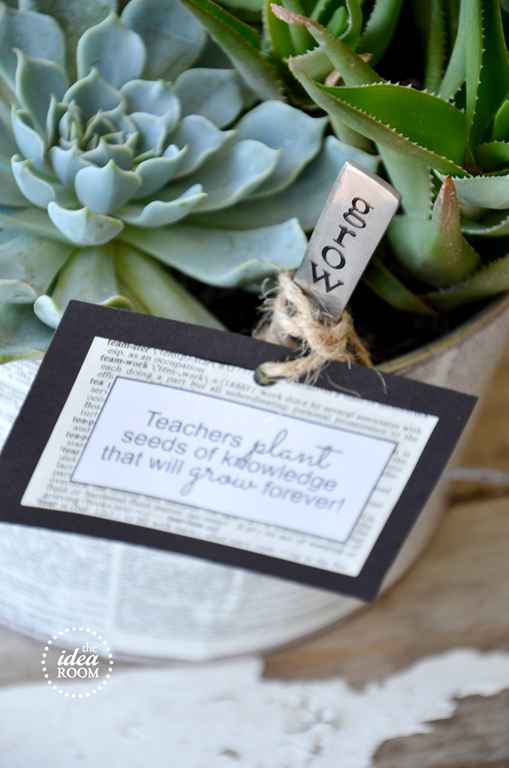 Such a cute take on a teacher gift! We’re setting up our summer vegetable garden, this would go a long way to help us! I would put it in our barely there vegetable garden! I am moving in September, this would be a great addition to my flower pots before hauling them across the country. I can’t wait to make this adorable gift…you have such a wonderful knack for creating lovely finished projects. 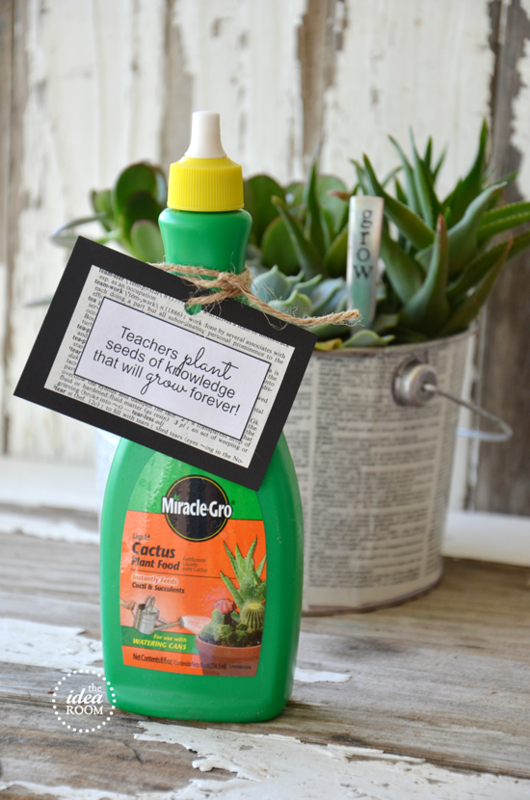 I love Miracle Grow I used it outside and inside but I have not used their Cactus food. Thank you for letting your readers (me) know about it! I’m off to the store…got a project to do!!!! I have killed every plant that ends up in my house. Last year I successfully grew herbs outside so maybe the toyarium with succulents would work in the house. Kids would love it either way. What a cute idea! 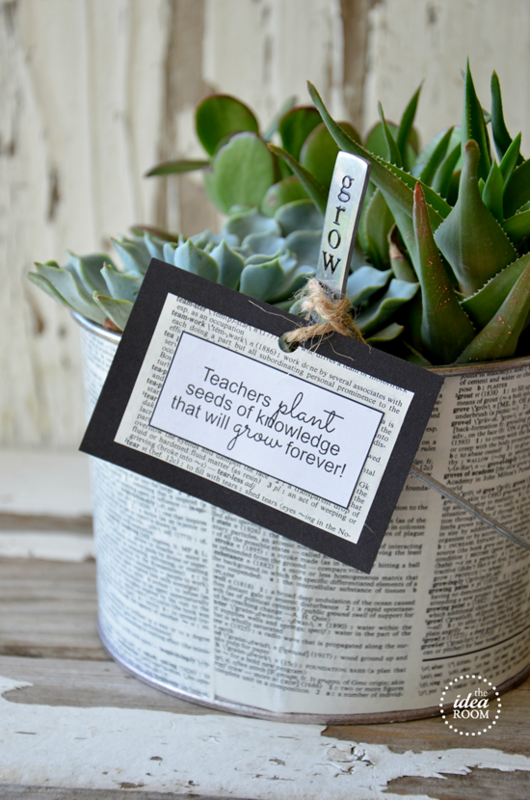 Teachers make all the difference and this is a fun, new way to show appreciation. And, Miracle Gro is amazing. We use it for all our plants and flowers. I would grow Blue Corduroy succulents in blue tinted Mason jars and put them on my kitchen windowsill. I just bought a home that the previous owners have really let go! I would use it on so may plants outside. As a teacher I would LOVE to get this gift! Thanks for the great idea! 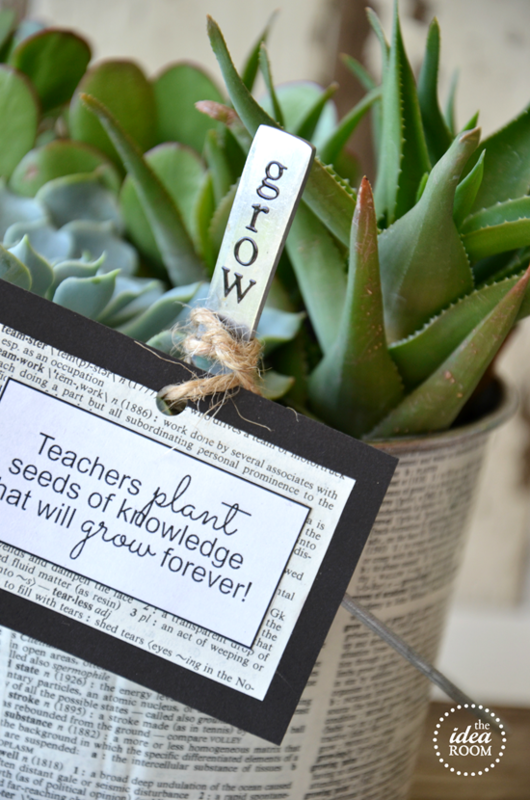 I have so many teacher friends in my life, would love to do this project to surprise them all! 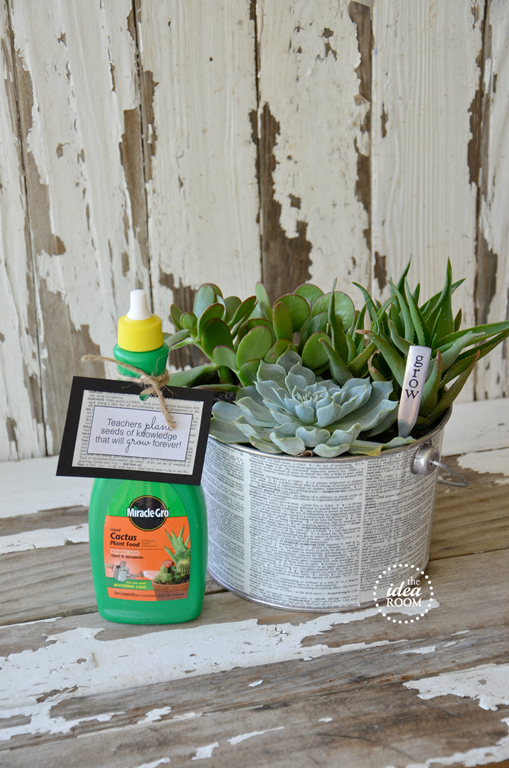 I am working on a succulent garden and did not know about this product! Cool. I want to make an open succulent garden now. I would love to plant an apple or peach tree in my back yard. Honestly, I think I’d try this project. It doesn’t look too hard and it’s adorable! Thanks for the giveaway! I think I would try this project! I’m a teacher and I would love to receive and I’m sure my kids’ teachers would too! 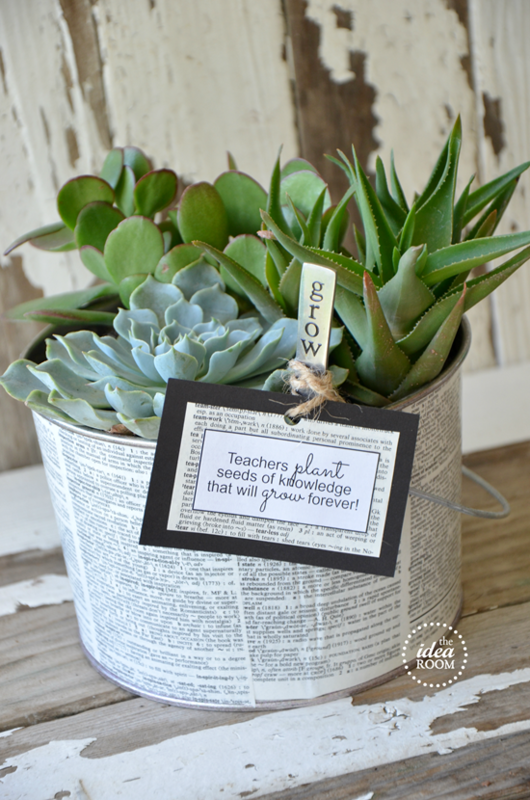 I love, love, LOVE this… I would make these for all my friends who teach. I would like to start a raised garden! I love the dictionary pages!! I’m dying to try an herb garden in containers! I love this project that is featured here! I’m planning to plant some tomato plants in containers. we’re actually planting our garden today! I would love to get the kids involved in planting a small garden of vegetables. I was thinking of water sealing the outside of some pots and having the kids paint on them then putting succulents in because they are so attractive and easy! We are getting ready to start our garden thankfully we waited because it frosted here last weekend! I would do a succulent garden. Simple and modern! I might even be able to grow this. love it. I love succulents! I want to start a small pot with them in it! Found the perfect container for a small succulent garden, on the hunt now for hens and chicks!! Our apple tree died last year, and I would love to plant a new one, along with some blueberry bushes. Oh the other day I found a bunch of old sand pails in the shed…and thought about trying to plant flowers in them and put them in the rock garden around the pool! They are all different colors so I think it would be so cute! My flower bed could use a ton of help! I have wanted to get a succulent garden for a long time. So I would start with that. Then I would work on some grass for the backyard as we have dirt and weeds. And then I would get some pots and have my kids help me plant, and care for them. I have started a huge pallet vertical garden project that needs lots more to fill in the empty spaces before I can get it upright! I have a indoor window box in my kitchen just waiting for an herb garden to be planted! I would probably start there and work my way to some topsy turvys to hang from the deck! I want to make window boxs for the windows in the back of my house with lots of flowers in them. I really want to have lots of plants in my home, but I seem to have a black thumb. I know using MiracleGro can help. 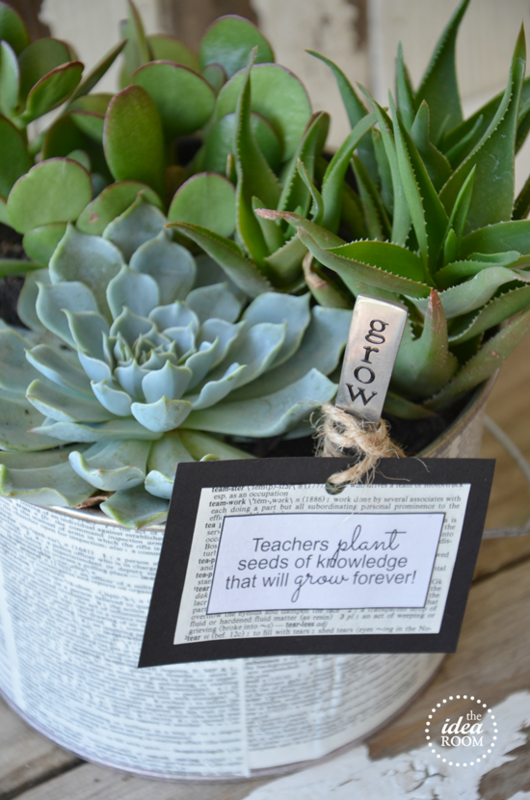 I would give a succulent gift to a teacher who cracks down in bullying! Help! When I try to download the printable it gives me a candy cane scrub label. Thanks! If you click on Previous Downloads it will take you to all the other downloads and not the peppermint labels! Hope that helps! Kori, I couldn’t find it either. Did you ever find it or get instructions on where to get it? I love this idea! Someone else mentioned the succulent wreath idea. I saw that and want to do that this summer as well.